I found this little gem though a post on face book when Gwyneth Paltrow blogged about going to this spa for a V steam. Intrigued as to what a V steam was I booked in to have one with a girl friend of mine. The staff there were all very welcoming and I was delighted to find that my friend and I could also use the spa’s pool and steam rooms. One of the spa spas signature treatments is a V steam. The treatment has been used in Korea for hundreds of years to balance the female hormone levels. You are naked beneath a gown and sit on a square thrown that releases herbal steam and infer red. You have a control so you can turn it up or down to your liking. The spa provides green tea and water next to you. I really enjoyed it and it’s a different way to spend time with my girl friends but a fun and relaxing one. We then enjoyed the spa’s four saunas. I love this spa. There is a Korean Hwangto Clay Room, a Salt Room, an ice room, and a Traditional Sauna. 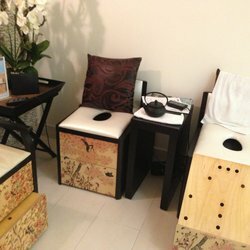 I have visited this spa twice now and enjoyed every moment, very tranquil and relaxing.